So as a blogger, one of my most difficult obstacles is the fact that we don’t own our own home. I know, millions of people on this earth don’t own a home. I’m not ungrateful, by any means. I’m very grateful to always have had a roof over our heads. But what I mean is that I really, really love to decorate my house. And as a blogger, it’s kind of hard to watch all these amazing room transformations and reveals from other bloggers doing these cool things to their houses. But I’ve found ways around this. And here are my tips for having a beautiful apartment. #1: When you first look at apartments, look for two things–two things that cannot be changed: layout and natural light. In my most recent apartment, the one in Arizona, I looked at the place we moved into and I really liked the layout and the unit we looked at had great natural light. So I was sold! But then of course we didn’t get that same unit–so the unit we got had terrible natural light. And looking back, I didn’t notice that there were virtually no windows in the living room. Just a sliding glass door leading to a covered deck–terrible for natural light. So when we moved to Utah, we moved into a place that has amazing natural light–wonderful huge windows with a western exposure. 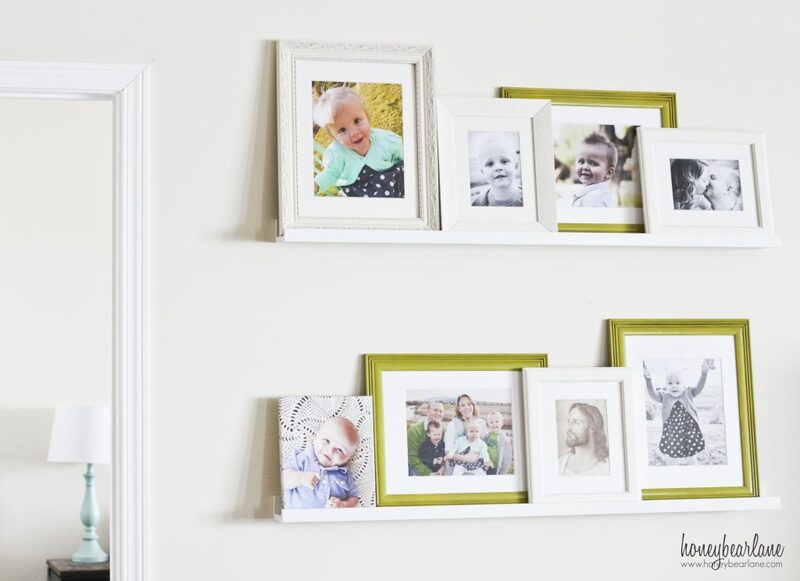 #2: Decorate with simple items that can be easily taken down. 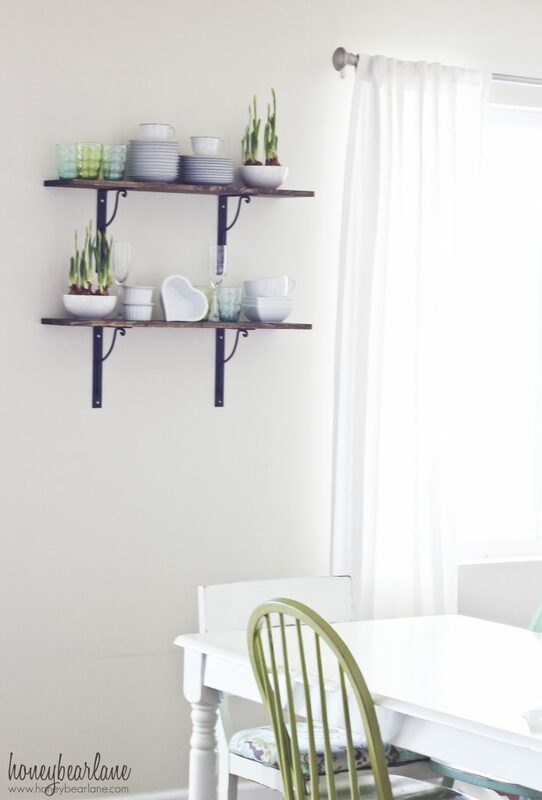 This leads me to today’s topic–decorate with shelves. I have tons of framed pictures and have wanted to do a gallery wall for a long time. But a gallery wall equals lots of holes in the wall and lots of work hanging and then taking down. So I decided to get some picture ledges from IKEA and use them in my house. 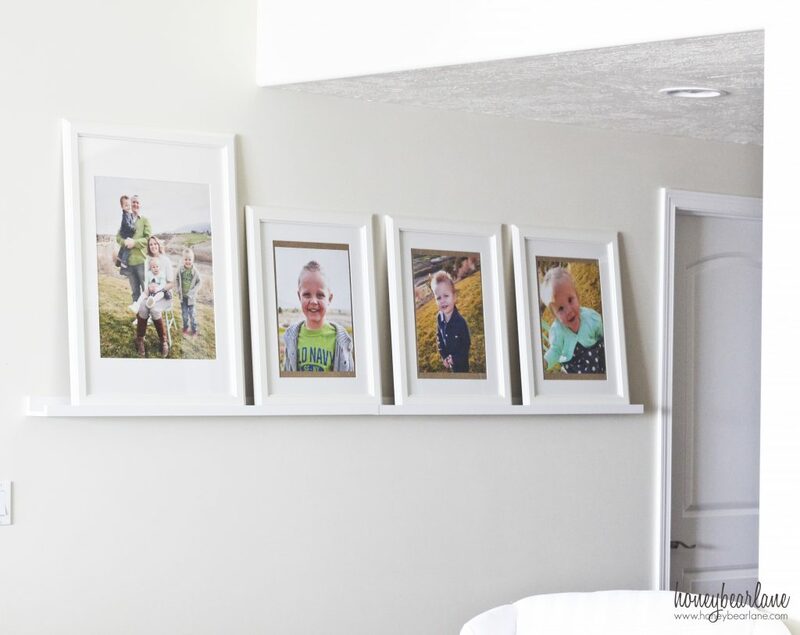 This works SO well because they are very easy to change up and do such a great job at decorating a large blank wall. These are the ledges I have in my hallway. There are two side by side. IKEA sells the ledges in two lengths but these are not hard to make. I have made them before. You can find plans on Ana-white.com. And yes, I realize that two of my pictures of my daughter are the same picture. But I really like having these ledges and when it’s time to move in a couple years, they come down, easy peasy. Only two holes to patch up. These next shelves are my favorite. They were unfinished, also from IKEA at $3 each. I’m sure that yes, you could get similar thing at Lowe’s or whatever but the price was great and I was already at IKEA. So I got them, along with the wrought iron corbels ($4 each.) I stained them with my favorite stain, Walnut. Then my sweet hubby attached them to the wall and voila–beautiful dish display space. I am so happy to have a place to display some of my most beautiful dishes–my grandma’s china, some paperwhites, and some pretty aqua and green glasses. Oh yes, and a fun heart shaped dish for Valentine’s. 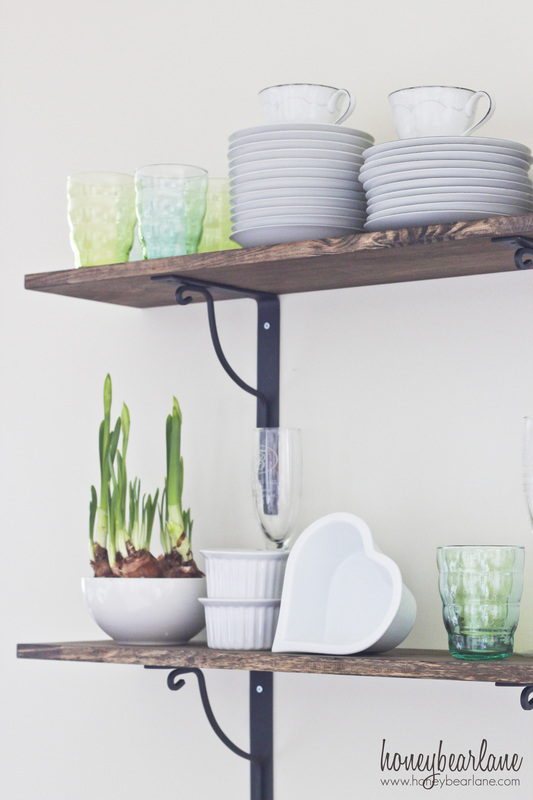 So do you use shelves in your decorating? How do you use them? Do you have picture ledges? How do you display your pictures and/or dishes? Oh I just love those ledges! I bet military wives websites have great ideas on hanging things. When we lived in military housing, we had white walls and you could only put so many holes in each wall….toothpaste is a great hole filler! I’ve been wanting to hang pictures from a curtain rod with ribbons. I saw that somewhere and thought it was so cute. Just love love love your blog, Heidi!!!! Especially the one the other day about places to buy fabric. Who knew??? Thanks so much!! I will have to remember the toothpaste filler idea–great one! I love those picture ledges. I wonder if they have them at IKEA in Thailand. Will have to check next time I’m there.